Last week, incoming freshmen Adam Clendening, Charlie Coyle, and Matt Nieto played in the Chowder Cup tournament in Foxboro, Mass., This week, the trio is in Lake Placid, N.Y., participating in USA Hockey’s evaluation camp for the U.S. Junior National Team. A group of forty-two players are competing for roster spots on the squad that will seek to defend the World Junior Championship won by Team USA last January in Saskatoon. Terrier assistant captain David Warsofsky was a member of that gold-medal winning team. The 2011 International Ice Hockey Federation World Junior Championship will be played Dec. 26, 2010-Jan. 5, 2011, in Buffalo, N.Y., just a long slapshot from Clendening’s hometown of Niagara Falls, N.Y.
A link to the USA Hockey evaluation camp prospectus is here. It includes bios of Clendening (pg.25), Coyle (pg. 44) and Nieto (pg. 53) The camp concludes with a series of exhibition games against Team Sweden and Team Finland. FASTHockey will Webcast five of the games. Details. All three Terriers have previously represented USA Hockey. Clendening and Nieto spent the past two seasons as standout performers in the U.S. NTDP program. Coyle, the San Jose Sharks first-round draft choice in this past June's NHL entry draft, skated for U.S. Select 18 Team at the 2009 Ivan Hlinka Memorial Tournament in Piestany, Slovakia last summer and later joined the NTDP U18s for Four Nations Cup in Finland where he scored the game-winning goal in the team's final game. THFB post on Nieto and Clendening at World U18s with video of each scoring. ProAm Hockey’s annual Senior Chowder Cup tournament—featuring U.S. and Canadian prospects with a sprinkling of current college players—concluded this weekend. Yesterday, Daily Free Press writer Scott McLaughlin took in a game featuring incoming freshmen Charlie Coyle, Matt Nieto and Garrett Noonan. A fourth, Adam Clendening, was rostered on the same Beantown Bullies Jr. Major team, but did not play. McLaughlin has posted some detailed observations on the three “rookies” who will be looked to for important contributions this season. Earlier in the tournament, Nieto (photo) scored with an assist from Noonan, while Coyle assisted on another goal in the Bullies' 2-0 win over the Philadelphia Little Flyers. NHL.com says Predators center Colin Wilson is one of seven young players poised for a breakout season. Mile High Hockey profiles Colby Cohen who will be in Avalanche rookie camp this summer. An athlete's wish, later in life, for a chance to replay a pivotal high school game—or event--has been the theme for a number of recent movies, including "The Best of Times" (Robin Williams/Kurt Russell, 1986). 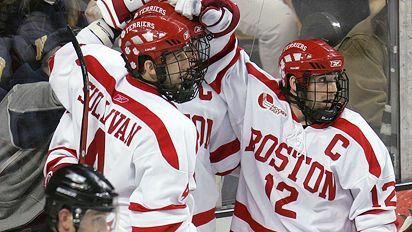 For former BU standout and co-captain Brad Zancanaro (photo, #12), the wish became reality thanks to the Gatorade-sponsored REPLAY The Series, which airs on various Fox Sports outlets. A 1999 game between Zanc’s Trenton, (Mich.) High School and arch-rival Catholic Central was suspended late in the third period, after Trenton rallied to tie it at four, when a skate slit a Trenton Trojan player’s jugular vein, nearly fatally (details) . Eleven years later, Replay and Gatorade chose that unfinished game to be the focus of its second season. And Zancanaro, now retired from professional hockey, along with his twin brother Tony, a former Providence College star, and their teammates were afforded the opportunity to turn back the clock and match up with CC again. 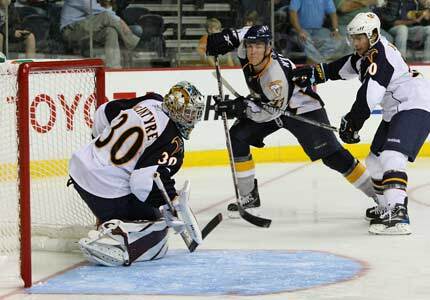 The opposing club featured several players who had gone on to college careers, including Yale goalie Matt Modelski. Several cable airings of the program are scheduled for the Fox outlets during the next few days. You also can watch videos of various segments online. From the Season 2 page, under Watch the Action, choose TV shows. A 90-point scorer in four BU seasons, Zancanaro also is in the Terrier record book for tallying the last goal in BU’s final game at Walter Brown Arena. The next night, when BU inaugurated Harry Agganis Arena, Zancanaro scored the first goal. We spoke with Zancanaro about his turn-back-the-clock experience with his high school teammates, which Trenton won, 4-2, with Brad—not-so-surprisingly, scoring his team’s first and last goals. Q. What was your reaction when you heard about the possibility of replaying the game? The recent down-the-road-a-bit verbals BU received from Anthony DeAngelo and Adam Erne have capped off a year of impressive recruiting successes that began last August. That's when Toronto Jr. Canadians center Robert Polesello visited Agganis Arena and "made an on-the-spot commitment to the Terriers for the fall of ’12." 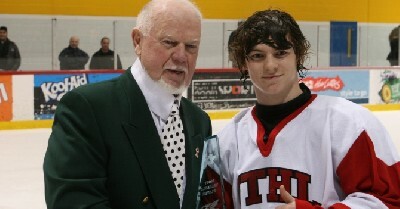 Since then, Polesello polished off another standout season, scoring 123 points for the Jr. Canadians and earning MVP honors ( photo with Don Cherry) for his team in the Greater Toronto Hockey League’s Top Prospects game. He was invited to Ontario’s Under 17 Provincial Camp in Oshawa earlier this month. Polesello was drafted seventh overall in the USHL draft by the Indiana Ice—whose president compared him to St. Cloud State top-scorer Garrett Roe— and the OHL Kingston Frontenacs made him their fifth round pick, owing to his verbal to BU. However, the 1994-birthdate, left-shot center is expected to play for the Vaughan Vipers of the Junior A OPJHL this coming season. ► Sharks' top draft pick Charlie Coyle, a BU 2010 recruit, talked with radio play-by-play broadcaster Dan Rusanowsky at Sharks Ice at San Jose during the team's prospect camp. 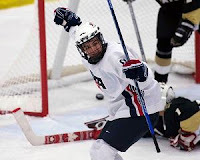 ►At the USA Hockey Select 15, 2014 recruit DeAngelo, found the back of the net all week, with six goals in five games, including a hattrick on Tuesday. His 6-3-9 scoring line was best among d-men and tied for sixth overall. Adam Erne finished with 0-2-2. Mlive.com’s George Malik, assessing prospects at Redwings Development Camp, sees a strong upside for sophomore defenseman Max Nicastro, and hopes to see continued development for him at BU. Malik's detailed analysis projects that “if Nicastro continues to improve in terms of his skating, strength, consistency and simply learning one of the hardest positions to play well,” he is potentially a top-four NHL blueliner. Bryan Miller, a former first team All Hockey East defenseman, will return to the ECHL Alaska Aces for a fourth season. A power play standout, Miller racked up 79 points during the past two seasons. When the Nashville Predators traded center Jason Arnott to the Devils, it provided former Terrier All-American and Hobey Baker finalist Colin Wilson (AP Photo) a window to become a top six former in just his second pro season. Bleacher Report talked with Wilson about being ready for prime time. Playing for a successful program at BU also helped bolster Wilson’s confidence. Even after three years working with BU strength and conditioning guru Mike Boyle, 2009-10 MVP Nick Bonino found himself facing a new physical challenge at the Ducks' conditioning facility. With nine NHL games and his first pro goal under his belt, Bonino is looking to earn a starting spot in Anaheim. At the recently concluded Dallas development camp, Stars management put a stamp of approval on sophomore Alex Chiasson’s progress in his first year as a Terrier. The Quebec native talked about his initial season on Comm Ave. and the Star’s laissez-faire approach to his development. “It’s been really fun,” he said halfway through the week-long event. responsibility at one of the highest-profile NCAA programs with a rich tradition of winning. Two members of BU’s 2010-11 blueline corps are lacing ‘em up for the annual New England Pro-Am Hockey Senior Chowder Cup Tournament beginning this Wednesday in Foxboro, Walpole and Canton, Mass. Sophomore Sean Escobedo is playing for Dynamo Hockey, while incoming freshman Garrett Noonan, fresh off an RBC Cup championship with the Vernon Vipers, is rosters with the Beantown Bullies Jr. Major. Tournament schedule (July 21-25). BU's two newest recruits, 2014 defenseman Anthony DeAngelo and 2013 forward Adam Erne, are in Rochester at USA Hockey's Select 15 Development Camp. After three days, DeAngelo has a 2-2-4 line, tied for 15th overall and tied for best among defensemen. Erne has a pair of assists, while earning kudos from an Amateur Hockey Report scout: "He showed why he is headed to BU with his tenacious play." For the second time in a week, BU has received a verbal committment from one of the top-rated 1995 American prospects. On the heels of blueliner Anthony DeAngelo's verbal, the Terriers learned that power forward Adam Erne has committed for 2013. A big, strong-skating power forward type reminiscent of a young Keith Tkachuk, Erne, who projects as a winger, has hands and scoring ability. He will be at the USA Hockey Select 15 Player Development Camp starting tomorrow. So, too, will '95 defenseman Anthony DeAngelo, who committed to Boston University -for '14 -- last week. Like DeAngelo, "Erne has long wanted to go to Boston University, so that part was easily arranged," according to USHR. Erne excelled at the 2009 Select 14, where he was described as a "Power forward type [who] bullies his way around. Is strong on skates; hard to knock off puck." Erne is the sixth elite prospect to commit to BU for its classes beyond the current incoming freshmen. The others are Cedar Rapids forward Cason Hohmann and NTDP U18 defenseman Alexx Privitera for 2011; Jr. Canadiens forward Robert Polesello for 2012, Erne and NTDP U17 defenseman Matt Grzelcyk for 2013; and, DeAngelo, who'll play at Cedar Rapids, for 2014. We'll need to start referring to the San Jose Sharks as the "Other BU West." The Sharks, who made Charlie Coyle their top choice in the June draft, and who had former BU co-captain John McCarthy make a handful of NHL starts last season as reward for a strong rookie season in the AHL, now have signed former Terrier captain Sean Sullivan to a one-year contract. Sullivan had spent four seasons in the Phoenix Coyotes system. He told The Patriot Ledger that he believes his fresh start with the Sharks will lead him to the NHL. Sullivan had a career-high 49 points for San Antonio last season. Brian Strait will have a former opponent, BC's Carl Sneep, as a teammate in Penguins training camp--as well as a competitor for a spot on the NHL squad. Strait discussed his pro rookie season in Wilkes Barre/Scranton with the Pittsburgh Post-Gazette. Former BU co-captain Pete MacArthur, who played in the AHL for Rockford last season, is weighing his options for next year. Mac talked with The Saratogian in his hometown of Clifton Park, N.Y., where he has been working out on a unique ice hockey treadmill. David Warsofsky discussed his experience in Bruins camp with NESN. At the USA Hockey Select 17 tournament in Rochester, 2011 recruit Cason Hohmann was among the camp's top offensive performers, finishing tied for third in scoring with a 3-6-9 line in five games. A skilled playmaking center, Hohmann (#8) also assisted on the game-winning goal in the tournament all-star game yesterday. Last summer at the Select 16 event, he earned a spot on the 2009 U.S. Under-17 Select Team that played in the Five Nations' tournament in Fussen, Germany. Hohmann was named today to the 21-man U.S. Under-18 Select Team that will compete at the 2010 Ivan Hlinka Memorial Tournament from Aug. 9-14, in Breclav, Czech Republic and Piestany, Slovakia. In September, Hohmann returns to Cedar Rapids for a second season in the USHL with 2014 recruit Anthony DeAngelo as a teammate. After a slow start, Hohmann put up a 9-27-36 scoring line during his USHL rookie season. In this video, he scored during regulation and in the shootout as the Roughriders edged Sioux Falls, 4-3.
good, productive college player and that's it. Junior center Corey Trivino, at the Islanders camp, talked with NHL.com about the importance of the upcoming season in his development. Two of the defensive anchors of BU’s 2008-09 national champions, Brian Strait and Kevin Shattenkirk, are spending the summer preparing for opportunities to earn NHL roster spots. After a strong first pro season with Wilkes Barre/Scranton in the AHL, Strait is one of the more experienced players at Penguins development camp, where he again "dominated the competition" in fitness training drills. In an NHL.com interview, Strait discusses his his development in the AHL and his goal of moving to the top level next season. The Bleacher Report suggests that "Shattenkirk has the skills to be one of the Avalanche's best defensemen immediately" and projects that "Shattenkirk can contribute 25-30 points as he eases into a power play quarterback role." The Lake Erie Monsters (Colorado’s AHL affiliate) have posted a number of player profiles including write-ups and photos of Shattenkirk and Colby Cohen. Former Terrier Associate Head Coach David Quinn begins his second season behind the Monsters’ bench. Subscription recruiting site U.S. Hockey Report is not known for hyperbole in describing hockey recruits and prospects, so yesterday’s headline—Terriers Hit Jackpot—was immediately intriguing. The prized prospect who has verballed to BU is Anthony DeAngelo, a defenseman for the Westchester Express who won’t arrive on Agganis Way until 2014. A 1995 birthdate from the Philadelphia suburb of Sewell, N.J., DeAngelo is a 5-11, 160, right-shot blueliner who led the Express 14 & Under team in scoring en route to a second place finish at the USA Hockey Nationals. … a take-charge type, an excellent skater with magical feet and hands, and an ability to read plays, quickly sizing up his options and choosing the best one. A power play QB type with a boatload of offensive skills, DeAngelo is a kid who can go end-to-end -- an exciting up-tempo player. He's also ultra-competitive, plays with an edge, and is not afraid to drop the gloves, as he showed at the Liberty Bell Games in Voorhees, N.J., last month, where BU assistant coach Buddy Powers was down watching him. Next season, DeAngelo, who is entering the ninth grade, will play in for Cedar Rapids in the USHL, where he’ll be the youngest player in league history. He was one of only five ’95s taken in the USHL 2010 entry draft. One teammate there will be 2011 recruit Cason Hohmann who is beginning his second season with the Roughriders. DeAngelo also has, for several years, skated for Travis Howe’s East Coast Selects elite tournament program, which boasts half a dozen other past, current and future Terriers as alums: Kevin Shattenkirk, Colby Cohen, Corey Trivino, Alex Chiasson, 2012 recruit Robert Polesello and Hohmann. Hockey scout Dan Sallows conducted a Q&A interview with incoming freshman Matt Nieto for his “Stars of Tomorrow” series. WTBU’s Greg Picker caught up with Corey Trivino at Islanders Development Camp where the junior center looked back at his injury shortened sophomore season and ahead to the upcoming campaign. Max Nicastro is in Detroit for Red Wings development camp. The sophomore defenseman was the Wings' third-round draft choice in 2008. The NCAA rules committee acceded to the overwhelming opinion of coaches and did not approve a rule change that would disallow icing during penalty kills. Coach Jack Parker was among those who vigorously opposed the rule change. Former Terrier wing Brandon Yip, who led all NHL rookies in goals per game last season, has signed a 2-year, $1.45 million deal with the Colorado Avalanche, according to the Denver Post. The British Columbia product, who scored 108 points in his Terrier career, including 20 goals as a senior, had injured a hand during training camp last September and didn't join the Avs until December, but became an instant point -- and hit-- producer as part of a youthful Colorado team coached by former Terrier standout Joe Sacco. Yip had been a restricted free agent. Continuing a trend that has people referring to the Avalanche as "BU West," Colorado also has signed former BU standout David VanderGulik as a free agent. Also a British Columbia product, VanderGullik had been a seventh round Calgary draft choice in 2002 and spent the past four seasons in the Flames' system. This past season, he was second in scoring for the team's AHL club in Abbottsford, Vandy's hometown, and made six NHL starts for the Flames in 2008-09. He and Yip were teammates on the 2005-06 Terriers' Hockey East championship team. During the upcoming season, VanderGulik is expected to play in Lake Erie (AHL) for former BU associate coach David Quinn. Kevin Shattenkirk, Colby Cohen and Zach Cohen, all of whom signed with the Avs after the Terriers' 2009-10 season, are likely to join him in Lake Erie. Sophomore Ben Rosen has been at New York Islanders mini-prospect camp this week, along with Corey Trivino, who was the Isles' 2nd round draft choice in 2008. Rosen is one of a group of undrafted players from the local New York-New Jersey-Connecticut area, most of whom are NCAA players. Dave Warsofsky, recently acquired by the Bruins in a trade, is at the team's development camp in Wilmington, Mass. Grant Rollheiser, a Toronto draft choice, is at the Leafs's prospect camp in Toronto. The competition for top hockey talent between NCAA schools and Canada’s major junior leagues is as heated as ever. The debate over which system better prepares a player for the NHL elicits diverse opinions in the hockey community. However, only a small percentage of college or MJ players will make hockey his career, so education become another important point of comparison. College coaches and recruiters have frequently disputed some of the claims made by the MJ leagues about their education packages. An insightful news feature in Kitchener, Ontario's The Record examines the OHL package, providing the colleges with further ammunition. Sophomore wing Alex Chiasson has been spending the first week of July in Frisco, Texas, at the Dallas Stars' development camp. A second round choice of the Stars in the 2009 draft, Chiasson sat down with Stars' fan site writer Mark Stepneski to talk about skating with other Dallas prospects, his first season at BU on and off the ice, and his expectations of playing a bigger role for the Terriers in 2010-11. Former Terrier Nick Bonino arrived at Ducks development camp today where he’ll see some familiar faces—Stephan DeCosta from Merrimack, Jake Newton from Northeastern, Kyle Palmieri from Notre Dame and Mark Mitera from Michigan, among others. Bonino and former BU captain Kevin Shattenkirk are among nearly 30 players--many former college stars--participating in a fundraiser for "The Big Assist" on July 14. The event to help provide critical care for Connecticut residents with spinal cord injuries was organized by former BC skater Ryan Shannon. The Colorado Avalanche offers a video feature on Brandon Yip who scored 11 goals in 32 games in his rookie season, playing for former Terrier Joe Sacco. Hockey prospect guru Max Giese evaluated San Jose first draft choice Charlie Coyle for the Sharks' Page blog. 2011 Terrier recruit Cason Hohmann will participate at the USA Hockey Select 17 development camp in Rochester, N.Y., beginning on Thursday. A Texas native now living in Michigan, Hohmann, a forward, scored 36 points in his first season with Cedar Rapids. He was one of the youngest players in the league.